The images circulating of this execution are extremely distressing and we will not be sharing them in this article. During my recent visit to Syria, I visited three of the seven villages that came under attack in the eastern countryside of Sweida City on that fateful day in July 2018. The grief and anger was still very raw but civilians spoke to me of the bloodshed that was a result of the meticulously planned ISIS attack, unhindered by the US Coalition forces camped in Al Tanf, 330km to the East. ISIS entered the villages from the east and traversed vast areas of exposed desert to do so, apparently undetected by those who claim to wage war on ISIS inside Syria. “The roads of Shrehi ran with blood” H Saab told me as we stood next to his family home in Shrehi where four of his relatives were murdered by the marauding ISIS gangs. He pointed to the still visible stains on the road in front of us and on the walls of the house and courtyard. Our journey began in Damascus. We left early in the morning and headed due south before taking the road that brought us to the east of Sweida city and to the villages that form a chain north to south, only about 1km apart. As we entered the province of Sweida, we began to see the elaborate memorials to martyrs killed in Syria’s war against Western-sponsored terrorism. Our guide told us that these beautiful monuments are in honour of the soldiers who have given their lives in defence of their homeland. Many of these impressive structures are placed at the entrance to villages “so their names are remembered for eternity by all those who live because they died“. We were told that some of these graves also date back to the 1925 ‘Great Syrian Revolt or ‘Great Druze Revolt’ against France. They are wonderful to behold, rising out of the dry desert plains, backdropped by the hills and trees that pepper the landscape stretching out in front of us. On the drive down to the villlage of Shrehi, our guide H Saab told us that thirty-five members of his family had been killed in the ISIS attack that took place in the early hours of the 25th July 2018. I asked him what he believed to be behind this attack. He told me that he thought it was to reduce SAA pressure on the ISIS terrorists holding out in Yarmouk Basin at this time. Perhaps to give them an escape route to the US base at Al Tanf. We entered Shahba City dating from Byzantine times and a city modelled on ancient Rome – “temples, triumphal arches, baths, a theatre, and a great wall surrounding the city were all built based on the plan of a typical Roman city”. We exited the ancient city through the remains of the East Gate and continued on to a number of towns and villages, some built during the Ottoman empire. H Saab told me that many of these village have labyrinths of caves that run underground beneath the houses. We drove up to one of the highest points in the village of Shrehi to meet with the representatives of the village and the survivors of the attack. We entered the traditional “madafa”, the welcoming room in the Saab family home. Once inside the Madafa the story of the attack was told by Khaled Saleh Saab. “We defended our land and our homes because this land is mixed with the blood of generations of our people. We will not accept that people without morals or humanity can touch this land. We stay, we will stand and defend this land until we die. Our youth killed these terrorists even though they had very old weapons, very simple weapons. The ISIS fighters had modern, expensive equipment but we still defeated them.” said Khaled. Khaled told us that the clashes continued from 4 am until 1pm. Between 4 and 5 am the ISIS fighters took advantage of the sleeping civilians and murdered many of them in their sleep before they had time to warn their neighbours. “The attack was a well planned military operation. ISIS coordinated their attacks in order to paralyse all the villages. They positioned snipers around the villages and along the roads that connect the villages to prevent people moving between villages or coming to the help of neighbouring villages. They came from the south and moved north.” Khaled continued. In one of the bloodiest massacres of the eight year war in Syria, 270 civilians were martyred during this attack, more than 300 injured. “Many of our young men, women and children bled to death in the street. Nobody was able to get to them or to transport them to hospital. If they tried they would be sniped.” Khaled told us. Khaled told us that, in his opinion, many of the ISIS fighters were on drugs, very likely to be Captagon. “We fired many bullets into them, but they kept fighting” he told us and this was confirmed by other family members in the madafa. In January 2017, “at least 137kg of Captagon, dubbed a “jihadist drug” and “the drug of the Syrian conflict,” was seized at Paris Charles de Gaulle Airport in a first for France, customs officials said, adding that half of the illicit cargo was destined for Saudi Arabia.” Captagon is a psychostimulant that is used as a performance enhancer by the extremist gangs that have invaded Syria since 2011. In Shrehi alone there were 37 civilians martyred. These included Khaled’s mother, father, brother and cousin who were killed in the home we were talking in. Just one of the countless heroes from Sweida countryside – Khaled’s brother, Iskandar Saab had served in the 102 “Batch” of the Syrian Arab Army which had been decommissioned just two months before the ISIS attack on his home village of Shrehi on the 25th July 2018. Iskandar came face to face with the crazed ISIS terrorists as he attempted to scale the hill leading up to his family’s house. He was shot in his right leg, his hand and his back. A local graduate of trade and economy and a math teacher, Mr Mahran Radi Saab saved Iskandar and managed to take him to his brother Khaled Saab. After rescuing Iskandar, Mahran was shot and killed by an ISIS sniper. Despite his life-threatening wounds, Iskandar managed to get into his car and drive 300m under fire from the ISIS snipers who had lined the roads joining the three villages of Rami, Shrehi and Shebki. “This land, this property belongs to our blood. It belongs to us. We will never allow any super-power to steal our land or to control our lives, our future” Khaled Saab reinforced this message several times during our talk. After the meeting we went to the home of Ziad Saab for breakfast, which in Syria translates into “banquet”. Ziad’s brother in law lived in one of the houses at the entrance of the village, one of the first to be attacked. As soon as the attack happened, Ziad’s brother in law managed to relay a warning to Ziad who lives with his wife and children deeper inside the village. Ziad took his simple hunting rifle and went to help. As he neared his brother in law’s home, he saw many ISIS terrorists firing randomly and fierce clashes between the ISIS fighters and civilians. It was still dark at this point. Ziad made the decision to return home to protect his own wife and children and to take his family to a safer place. Then Ziad tried to call his brother in law. An ISIS fighter answered the phone and told Ziad his brother in law was dead, he told Ziad to call an ambulance for his own family members – they would be killed also “there will be no escape”. The ISIS terrorists also attacked the brother in law’s two daughters and their mother – 10 year old Hela and 13 year old Hala. “Imagine that this were your village, or your neighborhood! Imagine that one of those were your house! Imagine that the same thing happened to you! Imagine that you lost a family member, or maybe two, or maybe more! Imagine that your mother, sister, daughter or son is still kidnapped and now in the hands of the worst terrorist group ever which is ISIS! And above all imagine that it didn’t mean anything to half of your brothers and sisters in humanity in this world,just because they are still sleeping, daydreaming and refusing to wake up! What hurts you is that if they did wake up 7 years ago, you would have had many of your beloved ones around you now, but they didn’t, cause they are still refusing to wake up! The media reports in the West were a cursory glance at the impacts of this ISIS attack upon this community, a skating over of detail and no mention of the potential connection to the US coaliton. As always, the true victims of this 8 year war will be brushed under the carpet while the focus remains upon the whitewashing of the perpertrators of the crimes against the Syrian people – the “rebel”-washing of the terrorist gangs who have been enabled to roam freely across Syria by the US Coalition and its Gulf State financiers of the sectarian ideologues described by the Colonial media as “moderates”. A burned out car seemed fused to the earth at the entrance to Shbeki. The car, a Skoda, had once belonged to Bahjat Atallah Saab who tried to rescue Zahi Jadallah Saab and his wife and son, Assem Zahi Saab, a law student. The entire car was targeted when they tried to flee the ISIS attack on Shbeki that began at 4am on 25th July 2018. The car came under attack by the ISIS snipers before being targeted by an RPG which turned the car into a furnace from which the occupants did not escape. Martyr Bahgat Saab was working as an Arabic language teacher. The horrific ISIS bloodbath continued in Shbeki, in fact it intensified. In this village, 60 civilians were martyred, many of them systematically picked off by ISIS snipers after they occupied one of the outlying homes set high up overlooking the buildings and streets that lay below. The house owner was in Lebanon when he heard news of the attack. He rushed home to find out what had happened to his family, he was shot and killed by the ISIS occupiers. Hazem, a young student in his third year studying research science at Damascus University, received a call at 4.40 am on the 25th July 2018, when he was in Sweida city. He was told that his home town of Shbeki was under attack by ISIS fighters. Hazem got in a car with five of his friends and tried to drive home, he was being guided by people inside the town who warned him which roads to avoid because ISIS had set up snipers along many of the entry roads into his village. Hazem entered from the south which was longer but safer. At 5.30 am he was still unable to enter because of the battles that were raging between the terrorists and the residents, determined to defend their families and land. 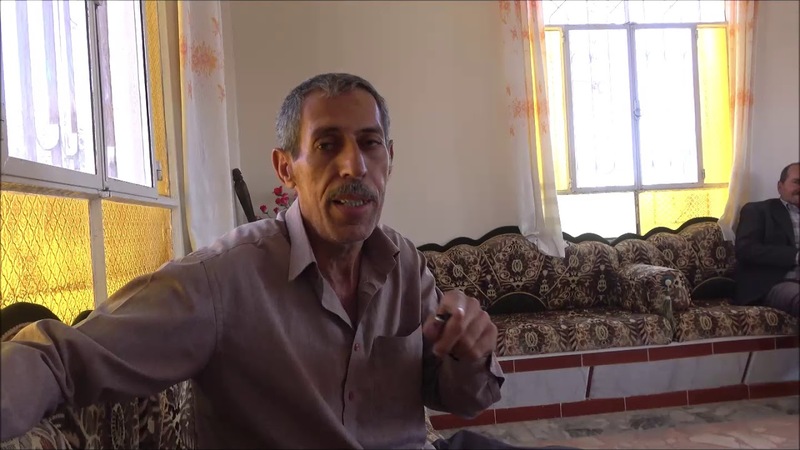 Hazem welcomed us in the traditional Sweida Madafa – the welcome room – of his family home. The sun poured through the glass onto the beautiful marble floor and chairs arranged around the sides of the room to provide a space to talk. Hazem recounted the appalling acts of violence committed by the ISIS terrorists who had entered the towns from the direction of the US base at Al Tanf, to the north-east of Shbeki, Shrehi and Rami..the villages I was able to visit. Hazem’s testimony was shocking. He told us that his family and other civilians were rounded up and taken to what he called the “bedouin house” at the outskirts of the village overlooking the plains and desert that stretch out towards the east and in the direction of the US military base at Al Tanf. There, the ISIS terrorists took all the men outside and executed them in cold blood. Among them were Hazem’s father, brothers, cousin and neighbour. The ISIS fighters then forced the women and children to come outside to see the bodies of their fathers, sons, husbands before they kidnapped them and headed north east with the kidnap victims, towards Tilal Al Safa. 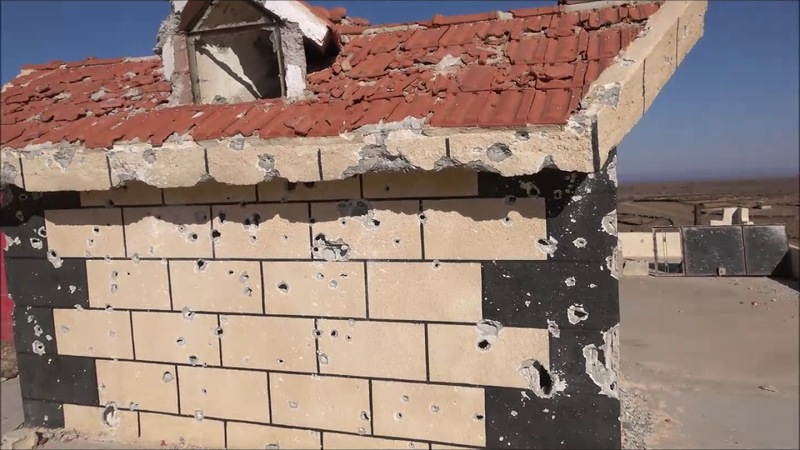 Hazem confirmed that 60 civilians were martyred in Shbeki, the majority from sniper bullets after ISIS fighters took control of houses placed high above the village which enabled them to assassinate the young men who flocked to defend their families, one by one. Most of these young men did not realise that their hometown was infested by ISIS snipers – just as in the other villages, ISIS had attacked at 4 am under complete darkness and while everyone was sleeping. 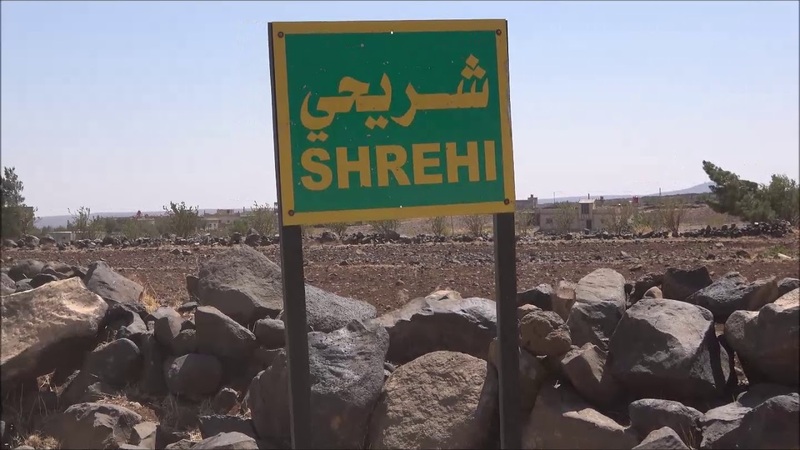 As in Shrehi, they shot out all the village lights during their approach before entering homes and murdering civilians, including children, while they slept. Hazem told us that a disabled child was beheaded as he lay sleeping in his bed. Hazem’s mother had been used as a human shield by the ISIS fighters who forced her to walk in front of them to prevent the civilians firing upon them. She was later among the kidnap victims although she and Hazem’s sister in law managed to escape and returned to the village just after midnight. They were terrified that ISIS had taken over the village so they slept in an abandoned house just outside the village. The following evening, they were able to recognise their neighbours and families who had survived and defended their village, preventing total occupation by the terrorist group. During the march, Hazem’s uncle’s wife had collapsed and had been unable to continue. The first group of ISIS terrorists left her where she lay and refused to leave anyone to take care of her. Later, another team of ISIS fighters followed on behind and executed her on the road. Her body was eventually found, the next day, 6km from the village. While we were talking with Hazem, a young boy came in to the Madafa and lay on one of the chairs. His name was Ismail, 8 years old. His father was murdered by the ISIS fighters and he was among the kidnap victims. During the move north-east with ISIS, Ismail had managed to mingle with some Bedouin children and escape the ISIS groups, before finally making it back to his village. Hazem showed us the road that ISIS took with the kidnap victims. SAA soldiers in Tilal Al Safa to the North East of Sweida where they have been waging a fierce campaign to defeat ISIS. The SAA have been making huge inroads in the area of Tilal Al Safa towards defeating the remnants of ISIS that have taken comfort in the shelter provided to them by the proximity of the US base in Al Tanf. One of the kidnap victims, Thoraya Um Ammar, has been executed by ISIS, the others await their fate, surely praying that the SAA will be able to reach them and to drive out and destroy their ISIS captors. The unity and resilience of the people of the Sweida countryside is what has enabled them to survive the ISIS attack and its traumatic aftermath. As I walked away from the stone “Bedouin” house that had been witness to such bloodthirsty brutality and violence, I spotted a flower stubbornly clinging to the wall outside. This is the spirit that has borne Syria through this 8 year war with such dignity and honour. The desire to defend their roots, to live and to love life against all odds. Vanessa Beeley is an independent journalist, peace activist, photographer and associate editor at 21st Century Wire. Vanessa was a finalist for one of the most prestigious journalism awards – the 2017 Martha Gellhorn Prize for Journalism – whose winners have included the likes of Robert Parry in 2017, Patrick Cockburn, Robert Fisk, Nick Davies and the Bureau for Investigative Journalism team. Please support Vanessa at her Patreon Account. The official, who spoke on the condition of anonymity to discuss a decision that has not yet been announced, said the decision would include the entire force of more than 2,000 U.S. service members. It was made on Tuesday, the official said. President Trump has long promised to conclude the campaign against the Islamic State and has questioned the value of costly and dangerous military missions overseas. The decision comes as tensions increase with NATO ally Turkey, which has promised to launch a military offensive against Syrian Kurdish forces, which are partnered with the United States against the Islamic State, in U.S.-controlled territory in Syria. The Wall Street Journal first reported on Wednesday that U.S. troops would be withdrawn from northeast Syria. "We have defeated ISIS in Syria, my only reason for being there during the Trump Presidency. 6:29 AM - 19 Dec 2018"